If the new year that began Jan. 1, 2019 didn’t bring much luck so far or you really enjoy celebrating a new year, join in the fun and good luck of Chinese New Year 4717 that begins on Feb. 4. Chicago celebrations kick off with a pre-New Year’s celebration Downtown Feb. 2, continue Feb. 5 and beyond until they end Feb. 16. However, Chinese New Year celebrations do go from Feb. 4 through Feb. 17 and end in some places with a Lantern Festival. There is a lot going on in the city to celebrate the Chinese Zodiac’s lunar year sign – the Year of the Pig. Also known as the Spring Festival, this Lunar Festival (there are others, particularly in Asia,) begins the eve before the first day and is often a time for families to get together. Think “new moon” to know when it begins. The Chinese New Year begins on the new moon between Jan. 21 and Feb. 20, 2019. This year, the new moon is Feb. 4, 2019. Here are some events that honor the Chinese culture and arts. More information is at Choose Chicago Chinese New Year and Chinese Fine Arts Society. Unless otherwise noted, the events are free. Head over to the Art Institute at 111 S. Michigan Ave. on Feb. 2 for music, crafts, stories, games and some talks in English and Mandarin about the museum’s Chinese art collection from 1 to 4:30 p.m.
Then, cross Monroe Street to Millennium Park and the Lurie Gardens for more activities. A Lantern Procession will line up about 5 p.m. and wind with a lion dance over to Maggie Daley Park about 5:30. Crafts and ice skating take place there until 7:30 p.m. The event is a partnership of the Art Institute of Chicago, Chicago Park District and Choose Chicago. 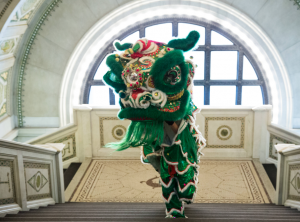 Celebrate the Year of the Pig with the Chinese Fine Arts Society at noon Feb. 5 at the Chicago Cultural Center. Watch lion dancers, Silk Road pipa master Yang Wei, martial arts and the Flying Fairies dance troupe. A special feature will be the China National Peking Opera Company including a sneak peak of comedic and acrobatic “At the Crossroads,” a famous opera based on a story from Water Margin. 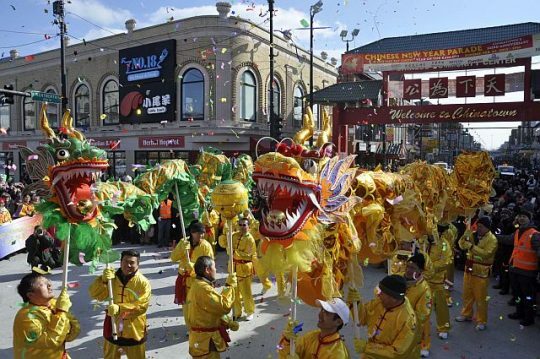 Join Chicago’s Uptown neighborhood festivities Feb. 9 for the Chinese New Year parade of dragons, lions and floats. It starts at 1 p.m. at Argyle and Winthrop near the Argyle “L” stop then goes east on Argyle Street to Sheridan Road, south to Ainslie Street, west to Broadway and then back to Argyle. At the Apple store on north Michigan Avenue there will be Music Lab of Chinese Instruments with Yang Wei, artist-in-residence at Chinese fine arts society on Feb. 9. The event, running from 1 to 3:30 p.m. also includes hands-on GarageBand on the iPad for the digital version and Sound-of- Wishes Ensemble. Plus, calligrapher Yijun Hu will draws to the music on an iPad. Apple is at 401 N. Michigan Ave.
Chinatown’s Lunar New Year Parade attracts thousands of folks from all over the Chicago area. 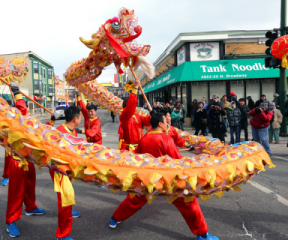 The celebration takes place at Wentworth Avenue and 24th Street in the heart of Chinatown from 1 to 3 p.m. Feb 10. Cosponsors are the Chicago Chinatown Community Foundation and Chicago Chinatown Chamber of Commerce. Celebrate the Chinese New Year at Symphony Center’s fifth annual concert at 3 p.m. Feb. 10. The event features the China National Peking Opera Company and the Hubei Chime Bells National Chinese Orchestra. This is a ticketed program. A pre-concert performance is in Buntrock Hall at 1:30 p.m. featuring the Dong Fang Performing Arts Association, Yellow River Performing Arts and the Chicago Chinese Qipao Association. These performances are free to ticket holders of the 3 p.m. concert. Orchestra Hall is at, 220 S. Michigan Ave.
Navy Pier celebrates the Chinese New Year with colorful performances and crafts and food booths in its AON Grand Ballroom, Feb. 16 from 1 to 5 p.m. Performing are the Chicago Chinese Cultural Center Lion Dancers, pipa master Yang Wei, Mongolian throat singer Tamir Hargana, the Flying Fairies dance troupe, Beidou Kung Fu, Zhong Hua Kung Fu plus traditional Chinese music by the Eight Tones Chinese Instrument Ensemble, Cheng Da Drum Team and others from Chicago’s Chinese community. The Chinese Marketplace opens at 12:30 p.m. Performances are at 1 P.m., 2:30 p.m. and 4 p.m. Navy Pier is at 600 E. Grand Ave., Chicago.